LOS ANGELES. Former WBC/IBF lightflyweight and WBO/WBA flyweight champion Brian Viloria said the other day he's in line for a world title crack in the undercard of “SuperFly 2” at the StubHub Center in Carson, California, on Feb. 24 as his manager Gary Gittelsohn is now negotiating with Tokyo promoter Akihiko Honda for a shot at any of the three reigning Japanese 112-pound titleholders. The Japanese champions are the WBC’s Daigo Higa, WBA’s Kazuto Ioka and WBO’s Sho Kimura. 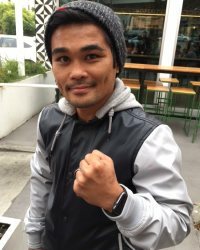 The IBF crown is held by Filipino Donnie Nietes whom Viloria said he would rather not face to avoid a confrontation with a countryman. Viloria said if there’s a rematch with Gonzalez, he’ll make sure the outcome is different. Even Srisaket won’t be a problem, he said, as the Thai may be strong and tough but lacks technique and style. HBO televised “SuperFly 1” at the StubHub Center last September and the network is set to do a sequel with Srisaket defending the WBC superflyweight crown against Estrada in the mainer. Gonzalez, Cuadras and Viloria are being considered for the undercard.